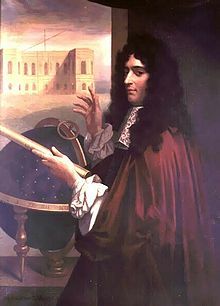 Giovanni Domenico Cassini was born in Perinaldo in northern Italy on June 8, 1625. He was brought up by his maternal uncle who looked after his education. He attended school in Valebone for two years and then attended the Jesuit college in Genoa where he studied astrology and astronomy. Although he studied astrology he admitted that it was not prophetic but at the time there was little separation between astronomy and astrology. In 1644 he was invited to become an assistant at the Bologna Observatory and six years later, when he was still only 25, he was made professor of astronomy and mathematics at the University of Bologna. In addition to his astronomical work, Cassini also did river engineering work and engineered fortifications for the Holy See. In 1668 he was invited to help set up the new Paris Observatory by Louis XIV of France. Pope Clement IX agreed to the trip believing it would be short, only two years at the most. Cassini once established in the new observatory made no effort to return to Italy. He remained at the Paris Observatory and three generations of his descendants ran it until 1794. Cassini is probably best remembered for discovering the Cassini Division, a open space between Saturn's A and B rings. Before Cassini it was believed that the rings of Saturn were one large solid ring structure orbiting the planet. Cassini's observations of the rings showed that there were breaks between the rings. We know now that the rings of Saturn are not solid at all, but made up of orbiting pieces of ice and debris. Cassini was also responsible for identifying four of the moons orbiting Saturn: Iapetus, Rhea, Tethys, and Dione. Cassini also shares credit for discovering the red spot on Jupiter with English scientist Robert Hooke Although Cassini initially believed in a geocentric model for the solar system he eventually came to believe in a solarcentric model, similar to that proposed by Nicolas Copernicus. In addition to craters on the moon and Mars named after him Cassini also has an asteroid named after him. Additionally NASA's unmanned probe that is currently exploring Saturn and its moons is named after him (for more information on the Cassini probe see here). As he grew older Cassini's vision failed him and his son Jacques began to run the Paris Observatory. Cassini died on December 14, 1712.